The Gannon University men’s basketball team kept the Porreco Pride of Erie Game trophy after defeating Mercyhurst University, 58-50, Saturday at the Mercyhurst Athletic Center. The Knights’ victory was largely a result of a second-half defensive stand that left Mercyhurst scoreless for 10 minutes, 37 seconds. The win, Gannon’s fourth in a row, left the team with an overall record of 18-8 and a 14-6 mark in Pennsylvania State Athletic Conference play going into Wednesday’s 7:30 p.m. matchup against Clarion at the Hammermill Center. In Saturday’s win over Mercyhurst, Gannon senior Zay Jackson received the Porreco Pride Game Changer award after recording 15 points and four rebounds while playing all 40 minutes. Jackson responded to receiving the award with appreciation for his teammates. Gannon shot 51.2 percent from the field, 37.5 percent from three-point range and 59.1 percent from the line. Mercyhurst, meanwhile, shot just 29.8 percent from the floor and 26.7 percent from beyond the arc. The first half of play was marked with tight competition as neither team was able to build a lead larger than two points during the first nine minutes. 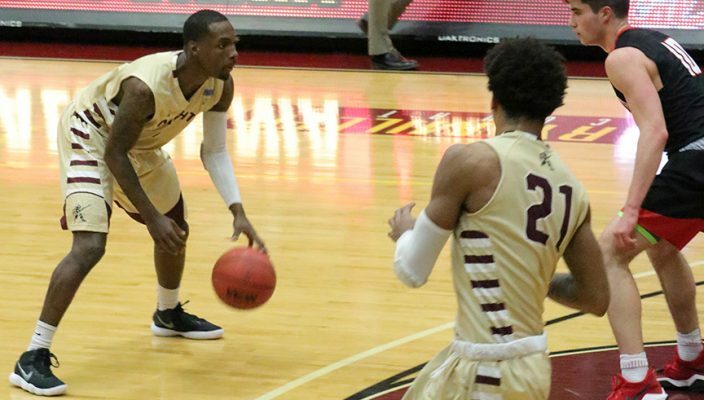 Gannon senior Jair Green sank a three-pointer and senior Gerrell Williams found a layup in traffic to create the first lead of the game at 22-15 with four minutes left to play in the half. But Mercyhurst, which had lost just twice at home in 11 previous games, countered by going on an 11-0 run to close out the first half and build a 26-22 lead. The run was sparked by three-pointers from Malcolm Walters, Stephen Spurlock and Lorenzo Collier. Gannon’s defense came out strong at the opening of the second half, holding Mercyhurst without a field goal for nearly 15 minutes. Patrick Smith nailed a three-pointer with 16 minutes, 59 seconds to play in the game, which gave Mercyhurst a 33-27 lead. But the Lakers wouldn’t convert another field goal until just 2:16 remained in the game. At one point, Gannon’s offense scored 10 straight points. Williams scored another layup along with picking up several points at the line. Jackson springboarded off the momentum, landing a three-pointer to end the 10-point run. The Knights held the lead with seven minutes left to play, 41-35. Mercyhurst landed only a single free throw over the 15-minute drought while Phoenix became an offensive force for Gannon, adding several layups late in the second half along with a jumper. The Lakers had a final run, coming within three points with 41 seconds left. But Gannon went 6-for-6 at the free-throw line along with a dunk by Williams with a second remaining to claim a 58-50 victory. Other than Jackson with 15 points, Phoenix was the only player with double digit points (10), as he shot 55.6 percent from the floor. Green led the Knights on the boards with nine rebounds as Gannon outrebounded Mercyhurst, 40-28. With their 14-6 conference record, the Knights are in the race for the PSAC Western Division regular-season title. Indiana University of Pennsylvania currently sits at first place, two games in front of the Knights with two games remaining. Gannon leads Slippery Rock by one-half game for the second-place spot and a first-round bye in the PSAC tournament, which gets underway with first-round games Monday. Gannon will host Slippery Rock at 3 p.m. Saturday in the regular-season finale for both teams at the Hammermill Center.